Hello Monday! I hope you all had a wonderful love-filled, sugar-coated, heart-shaped, chocolate-covered Valentine's Day weekend. Ryan bought me a gallon of wine, some chocolate covered strawberries and let me sleep in on Saturday until 10:00 a.m. It was the best day ever! He sure knows the way to my heart. 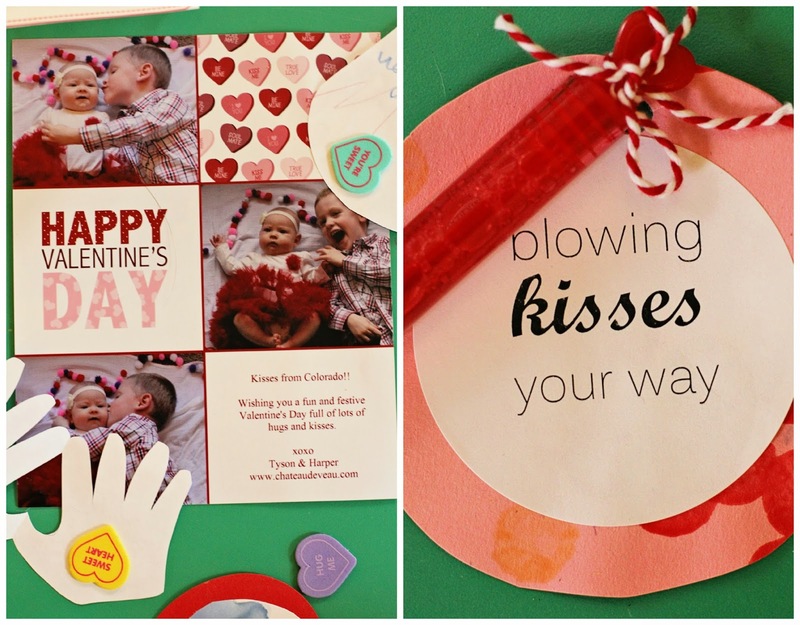 I mentioned last week that we were lucky enough to get to participate in two blogger Valentine exchanges this year. This one was organized by two of my favorite blog moms, Megan @ The Adventure Starts Here and Elizabeth @ Chasin' Mason. 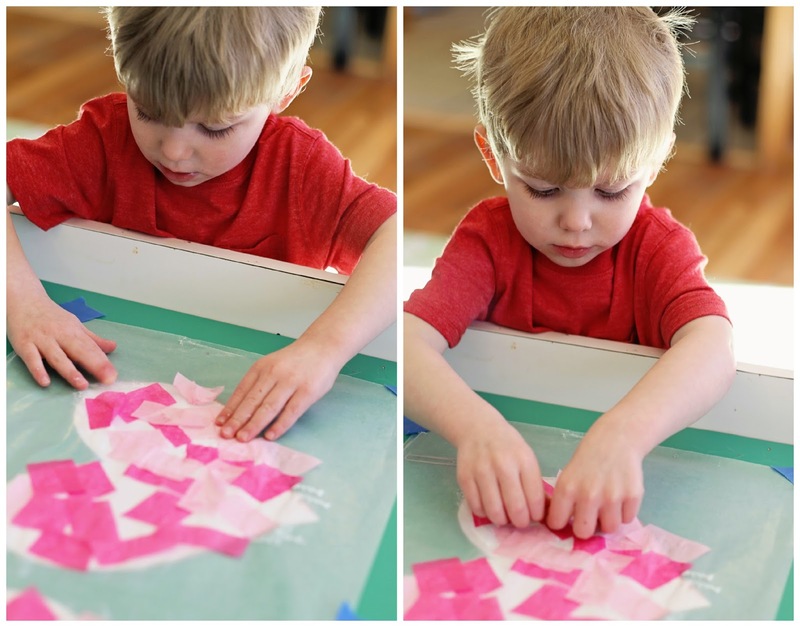 We totally got our "craft on" for this blog exchange and tried something pretty ambitious that we'd never done before - making tissue paper suncatchers! 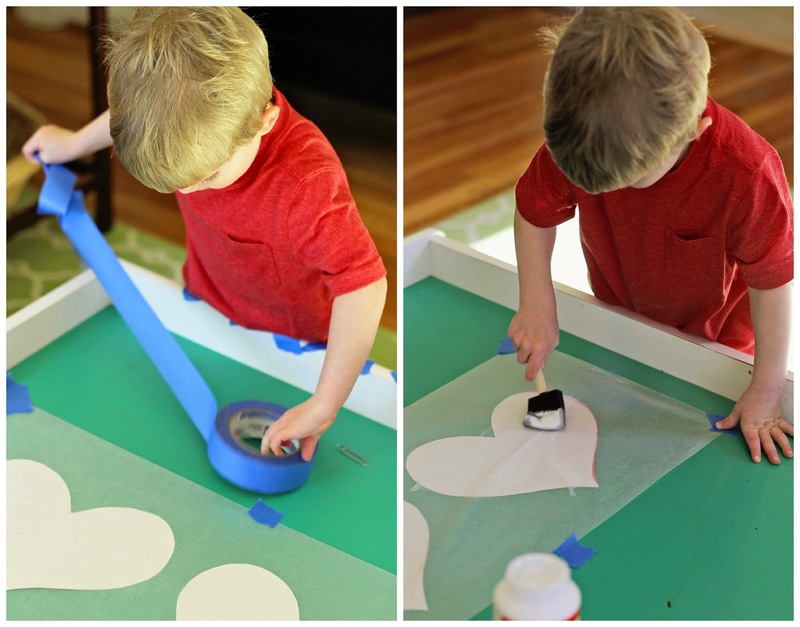 I thought this would be such a great craft for a toddler to help out with. In theory, I guess it was, but in execution, I was SO wrong. 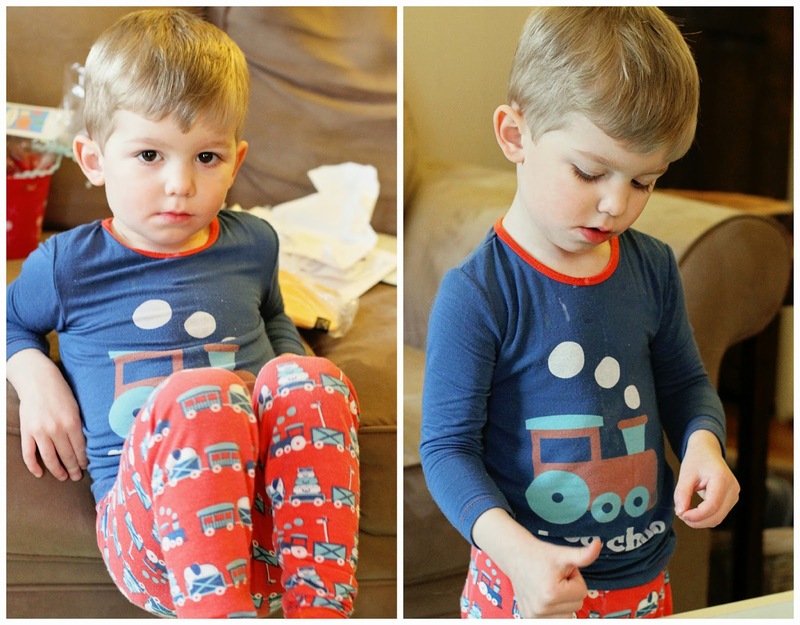 I am seriously out of my mind sometimes when I think that my 2.5 year old will sit, pay attention and help for more than 7 seconds. Within three minutes of me getting the stuff out to make these, I knew I was probably just going to end up with a huge mess, a glue-covered kid and tissue paper everywhere. Unfortunately, I was right. Step 1: Cut out two hearts from white paper. Place them on a flat surface under some wax paper. Use tape to hold the wax paper down. 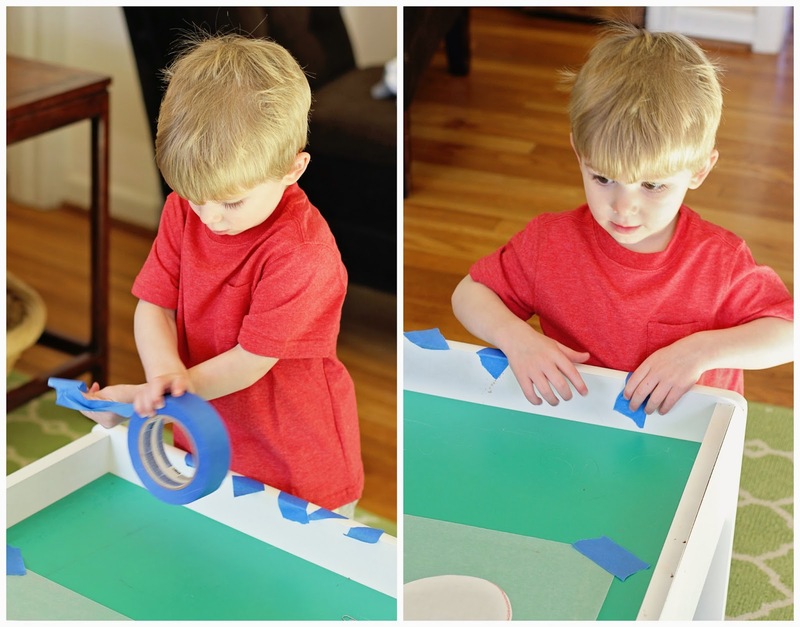 Try not to let the toddler pull miles of tape off the roll and cover himself, the table and the dogs with tape. 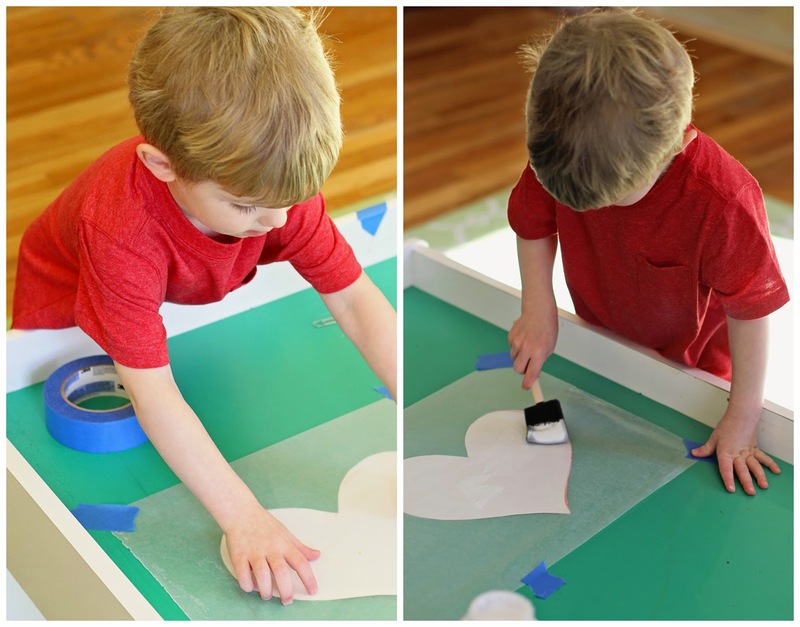 Step 2: Apply glue (or Mod Podge) to the wax paper over top of the heart. Try not to let the toddler eat the glue, stick his entire hand in it or dump it out all over the table. Step 3: Place small pieces of tissue paper on the glue on the wax paper in any random order you want to completely cover the heart. 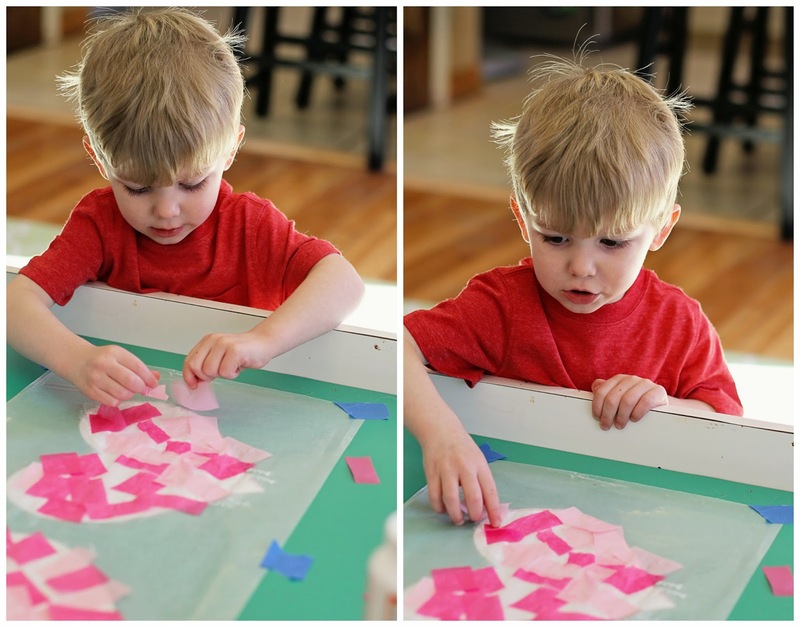 Beware, tissue paper will not only stick to the glue on the wax paper, but it will stick even better to the glue on your toddler's fingers and then be impossible for them to get off, resulting in lots of shaking, rubbing on pant legs and carpet. Step 5: Distract your toddler with candy or screen time to keep them completely away from the project while you pour yourself a giant glass of wine and spend the next two hours cutting, gluing and making a ridiculous mess in the living room and cursing yourself for trying to be a Pinterest perfect mom and consider throwing all this crap in the trash can. Step 6: Place another piece of wax paper on top of the heart and cover with a heavy book (finally found a good use for those old law school textbooks!) and let dry overnight (or a week, whatever). 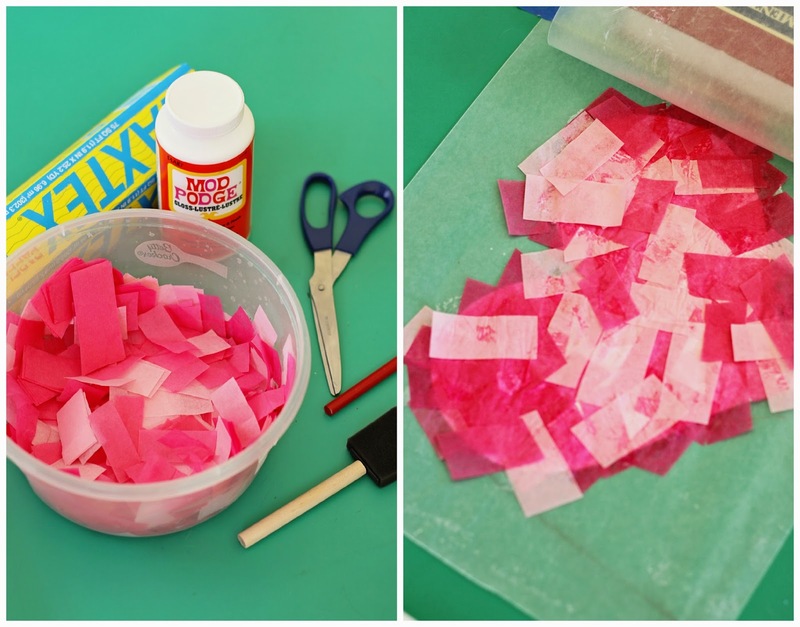 Step 7: Once dry, peel the top layer of wax paper off and use your heart-shaped paper template to cut out a heart. Step 8: Apply a paper border to the heart (optional) and a string to hang in the window. Step 9: Hang and enjoy! Of course, everyone else went above and beyond with their Valentine's too. I was so impressed with all the great ideas that everyone had. 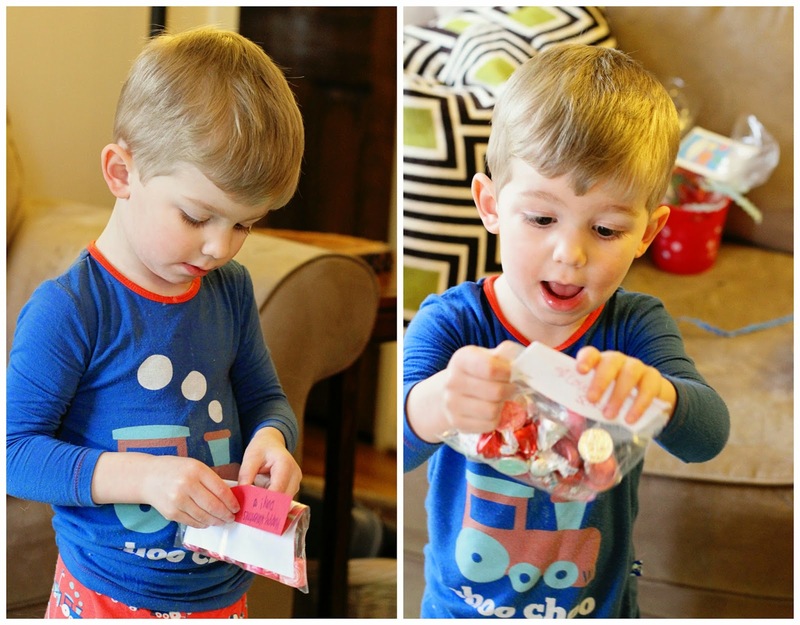 Stickers, puzzles, chocolate, popcorn...Mac is such a spoiled kid with these awesome blogger exchanges. He's going to come to expect some seriously amazing swag for every holiday. Make sure you check out all the other moms and kids participating in the exchange. A big thanks to Megan and Elizabeth for organizing and including us! We had so much fun with it! 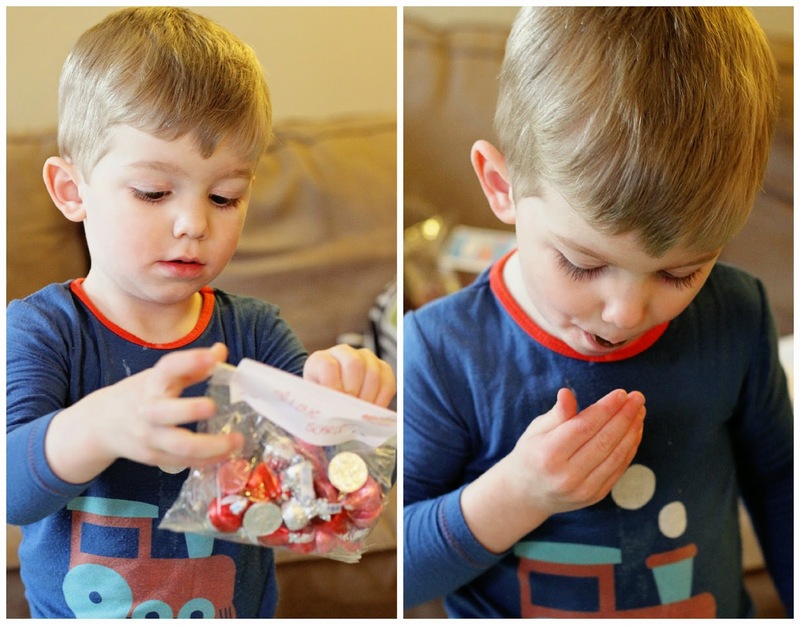 Hehe so glad he loved the chocolates! We have your sun catcher hanging in our window :) xo glad we were part of the exchange with you guys! Your posts always make me smile :) I love this idea and will have to save it. Oh my goodness, how CUTE! Love the heart sun catcher idea! 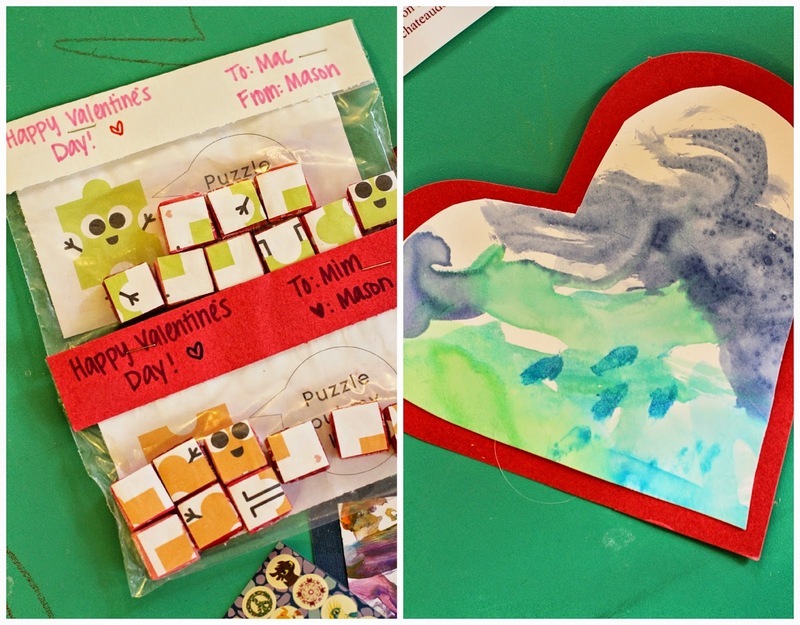 What a perfect way to have the kids involved in making it together, too! Definitely going to do this with Mia next year! Or maybe this week.... it's totally okay to do these crafts even after the holiday passes, right?! P.S. 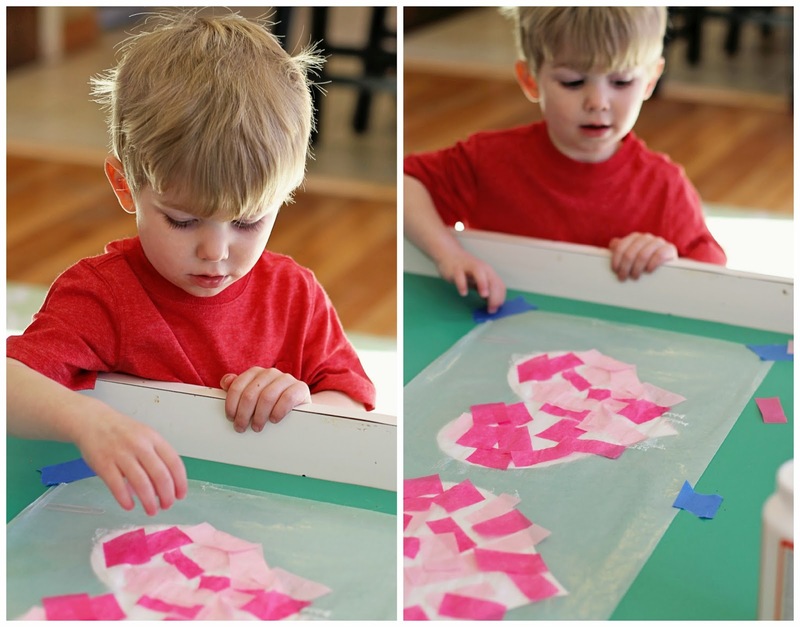 - love seeing this project made with wax paper. I haven't been willing to try this with my daughter because I've only seen sun catchers made with contact paper, and it seemed ridiculous to buy a whole roll of contact paper for one little craft. Might have to try this for St. Patrick's Day shamrocks! What a precious craft! Any craft worth crafting always has me questioning my sanity and my love of a clean house. You valentine's day sounded wonderful - sleeping till 10?!?! That's when I ready for lunch (just kidding)! Step 5 = the reason why we hardly do crafts around here ;) Couldn't have said it better myself! Pinterest is the enemy of moms everywhere. The suncatchers turned out super cute though! It LOOKS like Mac was into it and a great helper!! I was so impressed, such a beautiful Valentine - thank you!! :) I don't know how all you mommas do it?!?! Such a cute idea! Love the sun catchers! Like Laureen said, it totally looks like Mac was a big helper! 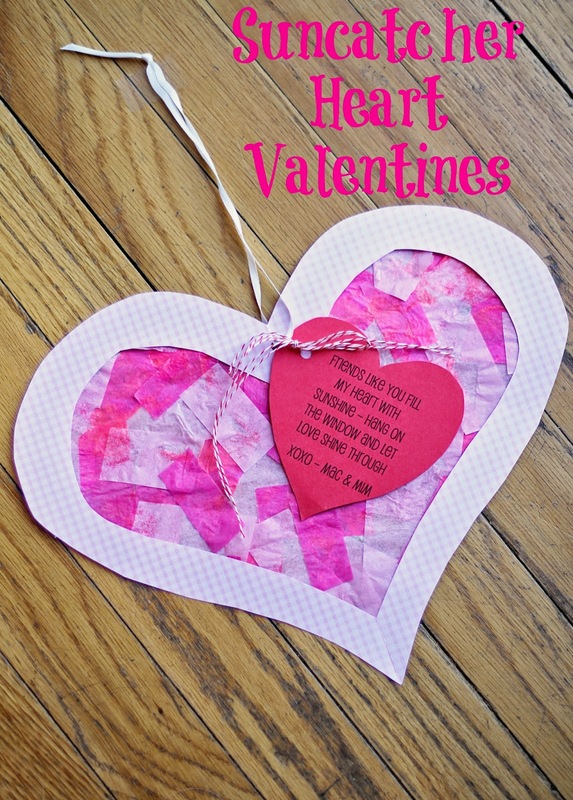 We loved our valentine and hung it in the window and promptly opened the blinds to let the sun shine through it. I may not take it down until.. Halloween? Think that is ok? LOL. Thank you for our goodies! Happy Valentine's Day! We do suncatchers all the time over here! To make it easier for toddlers, we use contact paper instead. That way no glue is involved and the kid just sticks the tissue paper to the sticky contact paper. You should definitely try that next time! Regardless we loved your suncatcher and its hanging on our sliding glass door! So glad you could participate in our exchange! Happy Valentine's Day! We made these for Valentine's too! A super easy way to do it is to get a roll od clear contact paper from the dollar store and cut two hearts out of that! The contact paper is sticky but doesn't make a mess! You can see how ours turned out here http://www.whenisnaptime.com/kids-fun/stained-glass-hearts ! Your little one is super cute! 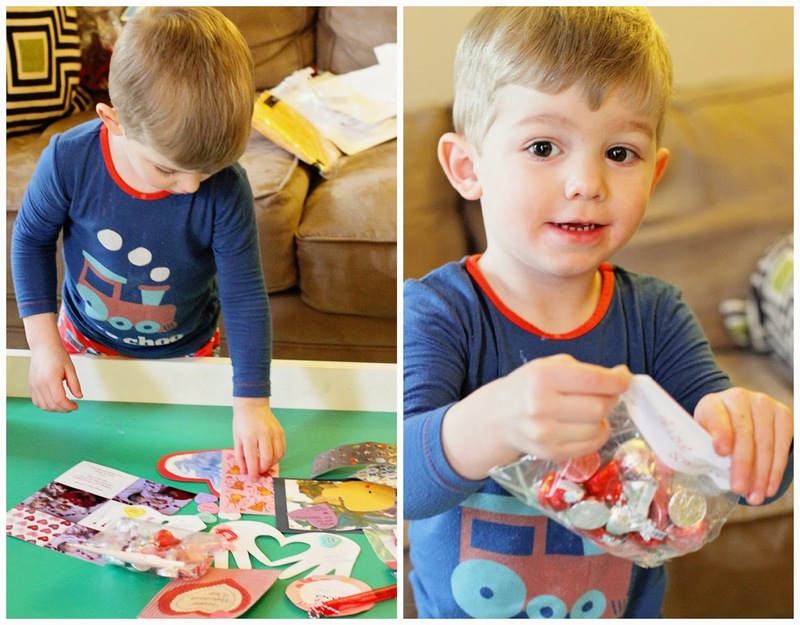 Those sun catchers (and all the valentine's) are adorable! I really need to do more crafts with Liam, but instead we spend as much time outside as possible! It's how I keep my sanity!